The author of the play says that such ancient works were preserved mostly in the Desna and Prypiat river basins, and in the Carpathian Mountains. Obviously, folkways were deeply rooted there, and for many centuries life did not change fundamentally. Ukrainians in these regions had a keen sense of place, which explains why they even assimilated the culture that came from outside. The fantasy-ritual play begins with the symbolic birth of Kateryna and Vasyl, which is announced by a lullaby and an 18th-century Christianized cant. In earthly life, both will encounter the forces of Light and Darkness. Summer solstice nights are especially dangerous, with river and wood nymphs wandering through the woods. 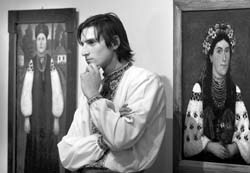 Vocal works from the Ukrainian baroque period and Classicism are used to celebrate the most intimate emotions that arise between the man and woman; after performing several rituals — a feud between clans, mourning the passing of maidenhood, and of course, courtship — they get married. 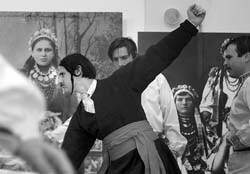 This original love story, based on a composite, centuries-old image, was performed during the Days of Ukrainian Culture in Switzerland last year. 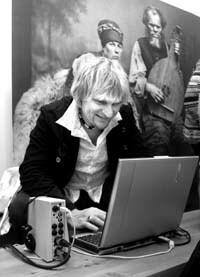 According to Hurtopravtsi’s Taras Kompanychenko, the Swiss audiences were captivated by the emotional and historical charms of the ancient Ukrainian songs, as well as by the dazzling diversity of folk rituals. Ukrainian audiences have their turn next.